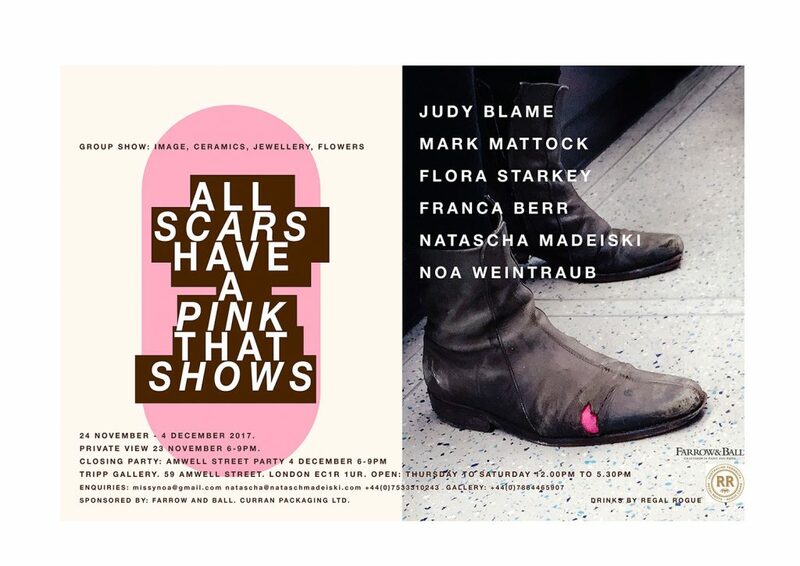 A show curated by Noa Weintraub and Natascha Madeiski, featuring a mix of cross-disciplinary artists; both established and emerging, ranging from Jewellery, Image, Floral sculpture, Product design and Ceramics. The show’s title is taken from a poem by the artist Marlene Dumas: ‘The Question of Human Pink’. my knowledge is skin deep. What do you mean, he said. Oh, she said, didn’t you know all scars have a pink that shows. Using this starting point, the show expands on the notion of scars in a wider context. Judy Blame is an accessories designer, art director and fashion stylist. In the early 1980s Blame’s non-conformist attitude and a desire to distinguish himself within the London club scene motivated him to produce jewellery. His modest resources shaped his DIY approach and led him to incorporate found objects as a foundation for making his adornments; early creations questioned established material hierarchies. It was during this period that he encountered a range of creative individuals including Derek Jarman, Anthony Price, John Maybury and Leigh Bowery who championed his inventive approach to making fashion accessories. In 1985 Blame helped John Moore to set up The House of Beauty and Culture in Dalston, London; a craft collective of like-minded creative contemporaries. This unique collective experience proved to be the first of many important collaborations as a consultant: John Galliano, Rifat Ozbek, Rei Kawakubo at Comme des Garçons, Gareth Pugh, Marc Jacobs and Kim Jones at Louis Vuitton. A further significant figure in Blame’s continued growth as a creative polymath was Ray Petri, nexus of the pseudo-corporate fashion collective Buffalo, who encouraged him to focus his talents as a fashion stylist. Blame was soon producing iconic fashion editorials with a range of photographers including Mark Lebon, Mark Mattock, Jean Baptiste Mondino and Juergen Teller for publications such as i-D, BLITZ and The Face. His instinctive ability to create symbolic images that embodied radical elements of popular culture and fashion led to an extensive career in the music industry as an art director and image consultant for iconic figures such as Boy George, Neneh Cherry, Kylie Minogue, Massive Attack and Bjork. Mark Mattock is an artist photographer. Despite an idyllic rural, outlaw youth, Mattock has a ‘trend’ credibility second to none. He began his career expelled from St Martin’s school of Art. His lack of college work as a the result of his extra curricular activities: graphics for John Galliano, working with Neville Brody, flyers for 80’s London warehouse parties, record sleeves, and stints at The Face Magazine. Successfully wearing more than just one creative hat he became design director of Arena magazine and was awarded Magazine Designer of the year in 1991 before conversion into photographer. Long term contributor to Magazines such as UK Vogue and iD, he has additionally worked regularly for countless more, from the Big Issue to American Vogue plus many major ad campaigns. ‘Flipping the coin’ a few years ago to return to his own work and the land, he has already produced a trilogy of photo books and is deep into a project concerning identity and the landscape of his now mythologised youth, and life long relationship with nature. Flora Starkey is a bespoke floral designer. Working from her studio, Flora creates arrangements for events including parties, weddings, fashion shows and photo shoots. Taking inspiration from many sources including the work of the Dutch Masters and Renaissance artists, Victorian flower photographs and the English country garden, her displays are both romantic and sumptuous. Focusing on seasonality, Flora will often use flowers and foliage she has grown herself. Her arrangements have been displayed in many prestigious venues including Abbey Road Studios, the V&A, Tate Britain and St Paul’s Cathedral and have dressed the entrance of Chelsea Flower Show in honour of the Queen’s 90th birthday. Flora’s work can be seen in numerous publications, including British Vogue, Vanity Fair, AnOther Magazine, and V Magazine. Flora has worked with photographers including Tim Walker, Mario Testino, Nick Knight, Glen Luchford, Mert and Marcus, Alasdair McLellan, Willy Vanderperre and Paolo Roversi. Franca Berr is a jewellery designer and maker. She is known for her edgy, humorous aesthetic that draws inspiration from classic costume jewellery and contemporary, popular, cultural icons. Berr’s new ‘Stillabunt’ collection of jewellery embodies sculptural character, with a nod to the work of artists Philip Guston and George Condo. Utilising quirky forms and vivid colours this is jewellery intended to be worn by bold, fun-loving spirits. Each piece is made to order from her workshop in Hackney, East London. On completing an apprenticeship as a goldsmith in her native Germany she moved to England to study jewellery design at Central Saint Martin’s College of Art and Design. After graduating she designed fashion showpieces for influential designers including John Richmond, Dai Rees, Markus Lupfer and Michael van der Ham. Berr has also collaborated with Liberty and TopMan. Natascha Madeiski is a London based architect and designer. Her projects span from architecture, lighting and furniture, to collaborative public art and independent research into advanced manufacturing and fabrication. More recently, she has entered the fragile world of ceramics, as always looking for innovation through experimentation with the materials, their manipulation and the processes involved. She works on the fine line between experimental and functional objects. Many of her projects are interdisciplinary as she collaborates with various artists, designers and artisans. She has participated in numerous exhibitions across the globe and her work has been widely published in books and magazines. Noa Weintraub is an artist and ceramicist. After graduating with a Fine Art degree from Chelsea College of Art, Noa’s artistic practice has travelled through design, fashion, illustration and ceramics. Initially launching her handbag label ‘girl’s best friend’, Noa sold one-off hand-painted handbags to exclusive boutiques and celebrity clients on both sides of the Atlantic. Simultaneously, she also began fashion styling, working closely with art director Judy Blame. In 2007 she then redirected her career back to her fine art roots and became a full time artist and illustrator. Conscious of the reference to traditional female activities such as lace making, cake decoration and baking, Noa is interested in women’s roles and place in society. Her ceramic practice questions what we regard as female activities. Pushing these ideas further, embellishing her vessels with frills, allows for the ephemeral existence of icing, and the fragility of lace to be preserved. Textures, textiles, details, patterns and predominantly her fascination with lace, have been constant reference points throughout. She uses stoneware clay, and with it makes work that has a delicate feel. “A nod to women not being as delicate and ornamental as they may appear or be perceived”. Her ceramics are sold at the interior design gallery Mint, Designers Guild and ceramics gallery Maud & Mabel.